College of Education specialist and doctoral students discuss their research during the workshop. On Thursday, June 1, over 30 graduate students attended the College of Education’s (COE) annual summer Graduate Research Workshop. The workshop is held to assist in preparing students for academic writing and research to be completed at the graduate-level. Attendees for this year’s workshop received information pertaining to graduate academic research including resources and information on the APA style, literature reviews, research methods, program policies, the Institutional Research Board (IRB) process and how to publish and disseminate research. A mock dissertation defense was also held to provide students with insight into the defense process. Pertinent to the purpose of the event, COE faculty member Richard Cleveland, Ph.D. presented research during the mock defense, originally conducted by fellow faculty member Bryan Griffin, Ph.D., on the negative correlation of self efficacy and anxiety doctoral students face when completing their dissertation. The research results suggested that students’ fear of the dissertation process could be better managed if they are provided with more information about the process as well as by inviting students to attend defenses of other students. The mock defense served as an opportunity for the College’s graduate students to experience the defense process and address any questions or concerns they had. 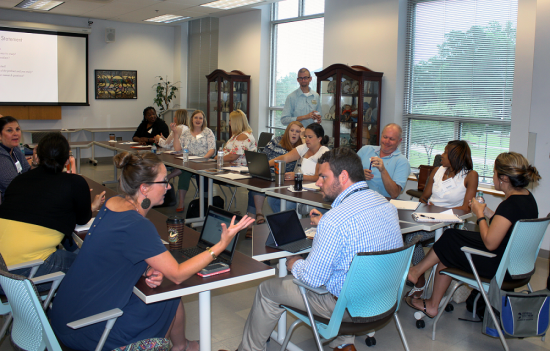 Several COE faculty participated in the workshop including: Richard Cleveland, Ph.D., Bryan Griffin, Ph.D., Lucas Jensen, Ph.D., Chelda Smith, Ph.D., Sabrina Ross, Ph.D., Lina Soares, Ph.D., Meca Williams-Johnson, Ph.D., Yasar Bodur, Ph.D., Teri Melton, Ed.D., and Graduate Academic Services Center Director Lydia Cross. The Graduate Research Workshop is hosted each summer and invites all specialist and doctoral-level graduate students to attend.